Zaatar is the Arabic word of thyme, it is a wild herb that grows throughout hills and fields of the Levant and East Mediterranean regions. Zaatar has become (along with olive tree) a symbol of the land of Palestine. It is strongly associated with the Palestinian identity that it’s being widely adopted by poets, writers and artists in their writings and songs. 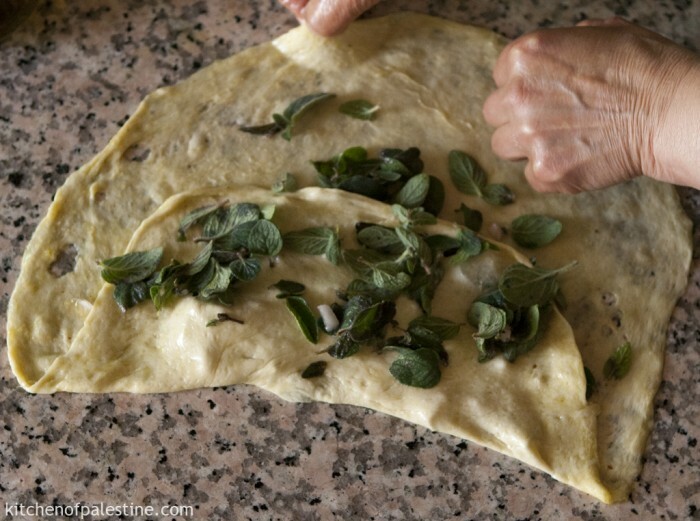 Zaatar bread also known as “fatayer fallahi” which means villagers’ pie, is a typical Palestinian pastry mostly made in spring, which is the official season of collecting fresh wild thyme. 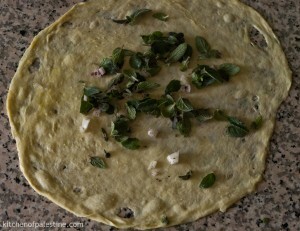 It is a flat bread, oily but crunchy, stuffed with fresh zaatar leaves, onions and sumac. 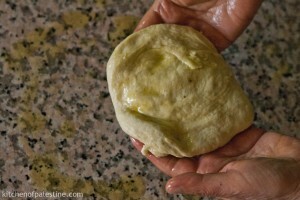 For the Dough: In a medium size bowl, combine flour, yeast, salt, sugar, and olive oil. Rub the mixture together until oil is well combined into the flour. Add one cup of warm water gradually while kneading using one hand (add more water if the dough is dry or flour if it is too sticky).Cover the bowel with a plastic bag and place it in a warm place for about 30 to 40 minutes or until doubled in size. 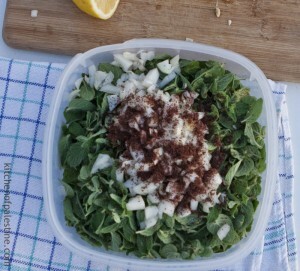 For the Filling: Meanwhile, in another bowl, combine zaatar (thyme) leaves, chopped onions, sumac, salt, and olive oil. Mix all together and leave aside. Cut off the dough to form three or four balls. Roll each of them on a soft surface which is greased with olive oil using rolling pin until you make a paper-thin sheet of dough. Another option is to use your hands to punch down the dough until it becomes very thin that you can’t punch it further (don’t worry if the dough ends up with some holes). 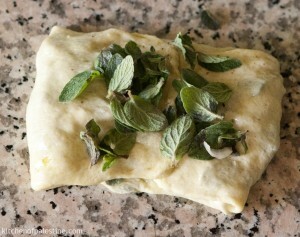 Add a pinch of zaatar stuffing and a pinch of olive oil to the dough sheet, fold two sides of the dough to the middle. 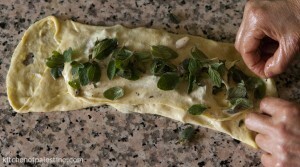 Add another pinch of zaatar stuffing and fold the dough. 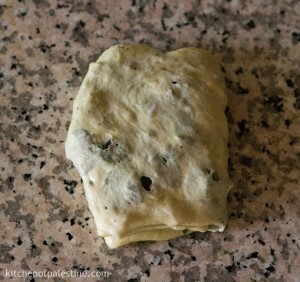 Keep adding pinch of zaatar and folding the dough until you can’t fold it further. (The photos should explain the process better). Leave them for 10 minutes to rest. 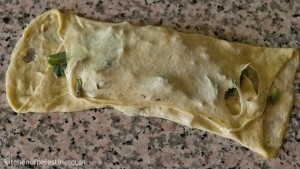 Place stuffed dough pieces in an oven tray greased with olive oil. Punch dough down with your hands until flat. Place the tray in a preheated oven for about 10 minutes or until they become slightly brown or golden. Flip them to the other side and leave them for another 5 minutes. It’s better to be served hot to enjoy the crunchiness of the bread. Typically served with fresh yogurt or tea. 54 Comments on "Zaatar Bread (Fatayer Zaatar)"
Those look wonderful. يسلموا هالايدين. it looks amazing ! i’ll give it a try as soon as i find fresh thyme leaves !! thanks for sharing. Actually, Zaatar is a kind of oregano, oreganum syriacum, so fresh oregano would be a better substitute than thyme. And it’s gorgeous, thanks for the recipe. You are always welcome Lindsay..
I’ll send you my recipe for Palestinian buns, a recipe I invented when the UN declared the State of Palestine. This look so good! I think I will make them today. Thanks for sharing! I’ve never tried it with oregano. I think it would make a different and stronger taste. I cooked them at 200C in a fan oven, increase to 210C if it’s not a fan oven, Gas I would use Reg 7 or 8. Thanks David and sorry for replying late.. I usually bake it in lower level of the oven. Temperature 180 c.
Hi Inas! 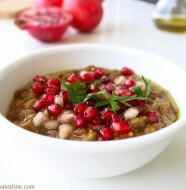 Thank you so much for stopping by.. I’ve been so busy but when I read this comment 2 days ago, I decided to put everything aside and work on a new recipe/post :) Bamieh was the result..
Shukran Lindsay :)) You should spend one of the Ramadans here! Looks great and easy too! Just a question, do u make imtabak the same way? Do u have a recipe for imtabak? M’tabak, Fatayer Zaatar, Zaatar Fallahy, Zaatar Bread, Malateet Zaatar, are different names for the same recipe. Yislamoo edeki and thanks again and please dont stop posting! Shukran Farah for stopping by and commenting! Such comments make me feel that what I’m doing is really worth doing.. This looks so lovely! 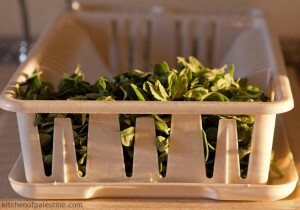 I am new to Palestinian cuisine and was wondering what would be an appropriate substitute for fresh wild zataar leaves. Where I currently live there is only home grown thyme which has substantially smaller leaves than the zataar in your photo. Is the taste different? 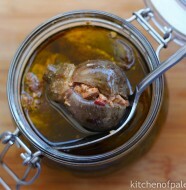 If this thyme can substitute for zataar, would you still recommend using the same amount for this recipe? Thank you so much and I hope to start cooking your lovely recipes soon. 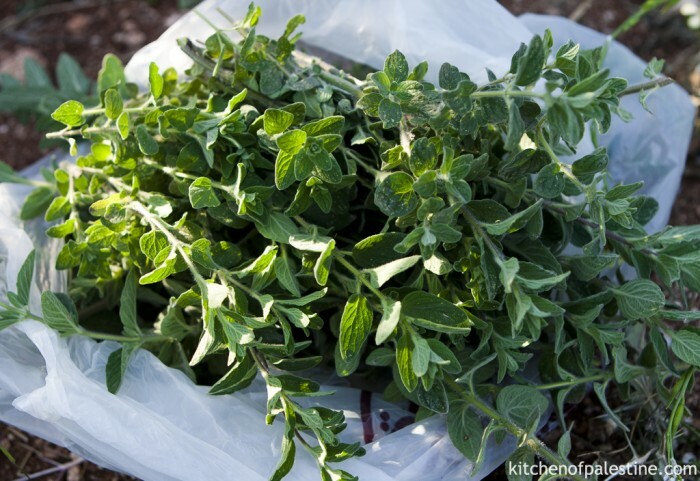 Home grown thyme (or garden thyme) is very similar to wild thyme (the one in the picture), so it would make a perfect substitute. The used amount of thyme in this recipe is not critical, something between 2 and 3 cups. It depends on how strong you like the flavor of thyme. As for the size of leaves, this picture was taken in spring which is the best season for thyme to get bigger and healthier. I think it’s kind of food that turns out delicious every time you make it no matter what. Combining olive oil with zaatar and having them with any type of bread, always satisfying! hi eman, thanks for this recipe! there is not really fresh za’atar in the souq right now (im in bethlehem :)) but i have a ton that i dried last summer – could i sub it? thanks! Yes it works but you need to soak it in water first. One thing to expect, dried zaatar has more bitter taste than fresh zaatar. It is heavenly Eman! Eating it right now with zeit & labneh… mmmm. Great recipe! Much appreciated. I grew up eating these while living in Ramallah. I did not expect to find the entire recipe online. 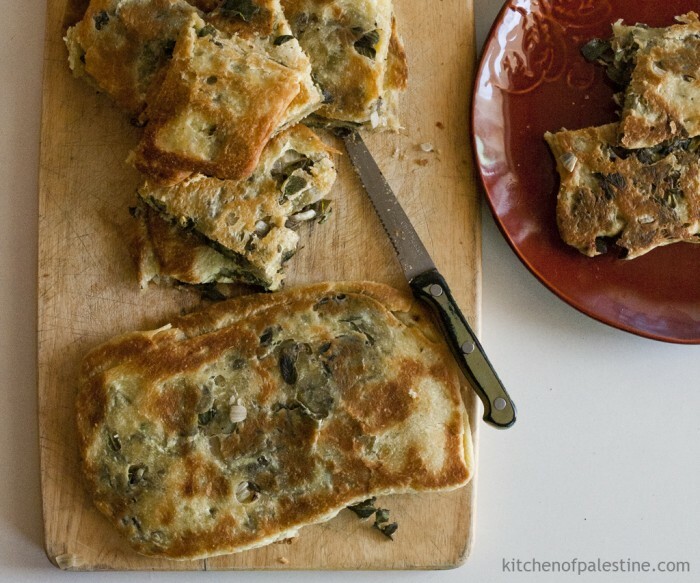 My mother has shipped me some zatar (from Palestine) and I am in the process of making these fatayer right now. Thanks! Thank you for this recipe! My husband and I loved it!!! SO flavorful!!! Merci de nous faire connaître et partager ces délicieuses recettes ! Continuez, c’est la mémoire de vos mères, grand-mères, ……. I difenitly will try this recipe tonight. Would you please post Zatar and cheese akras (falahi) as well? 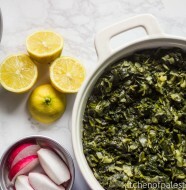 Just wanted to know if i can use dried zaatar leaves for this recipe? I learned this Summer that Zaatar is not actually Thyme, as we’ve all grown up learning. In its green/fresh form, it’s known as Savory, which is grown in both the Summer and Winter varieties. This Summer I tried the Winter variety, but haven’t tried the Summer. I was told by my Farmer (wildonionfarms.com who actually grow it each year!) 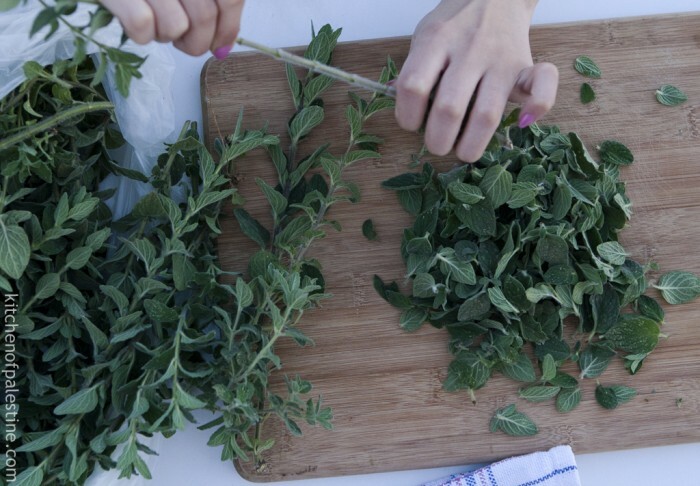 that the Winter Zaatar (Winter Savory) has a more robust and delicious flavor. I ordered bunches and bunches, dried, and ground up to use as a fresh spice for fish and other dishes. Check it out! I made it today. And even my mother in law said: Delicious! Thank you! 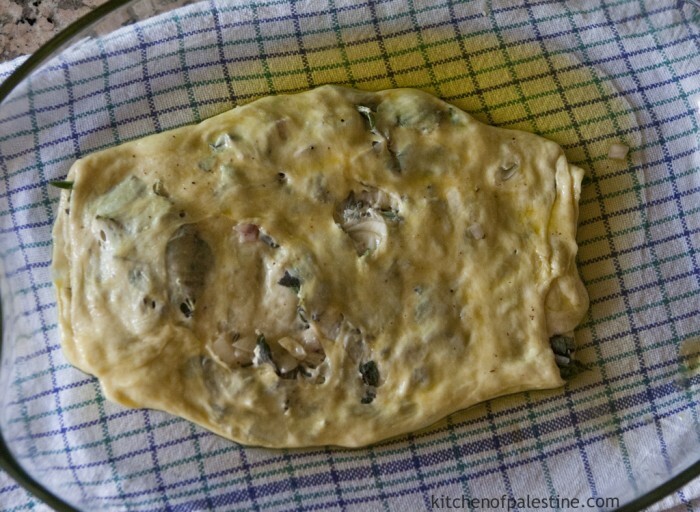 I am glad that I found your blog, as I had been looking for the recipe for Fatayer Zaater. I made them several times and they turned out just right. I am not sure if anyone already commented on this or not. Zaatar is NOT thyme. Zaatar is indigenous to the Levant (Palestine, Lebanon, Syria) and is not native elsewhere. It is slightly similar to thyme, which is why sometimes they call it thyme. 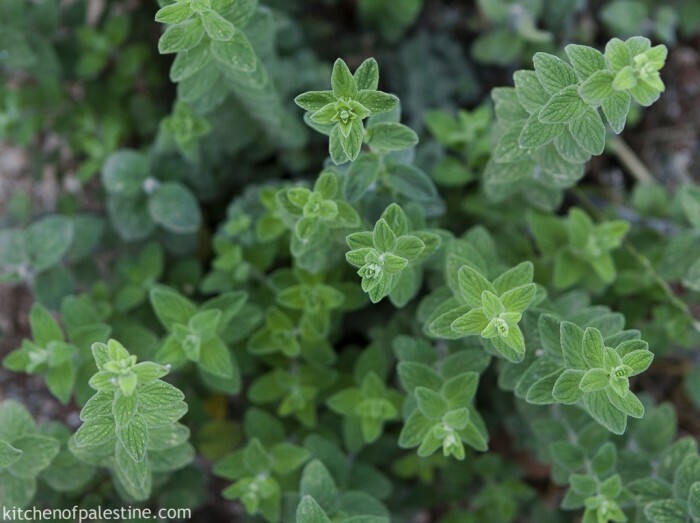 Also, in an effort to make it comprehensible and available to westerners, Levantines sometimes refer to it as thyme. But it is not the same plant.